Are you looking for ways to increase registrations for your course, offline classes, or online school? 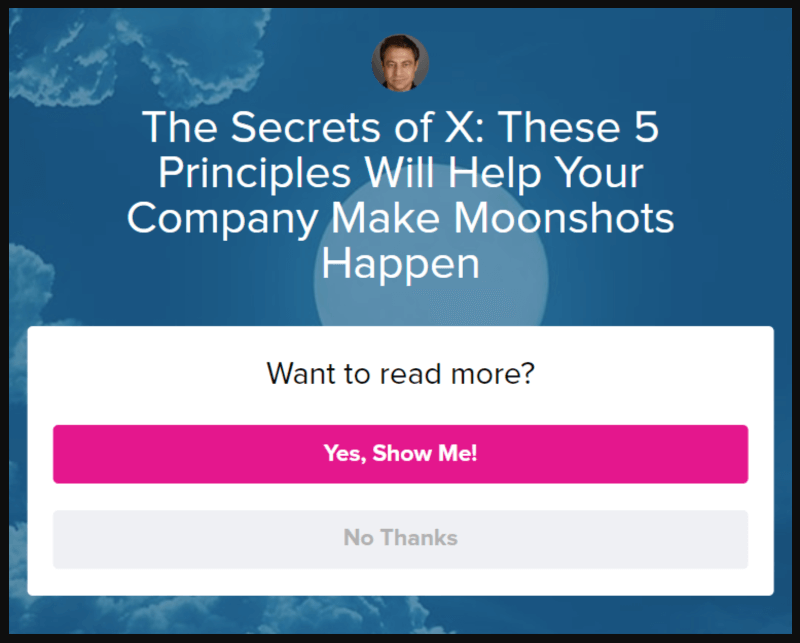 In this case study, we share how Singularity University generated 967 new leads for their university using a single optin, and so much more. This case study is packed full with examples and experiments you can use to see similar results today. 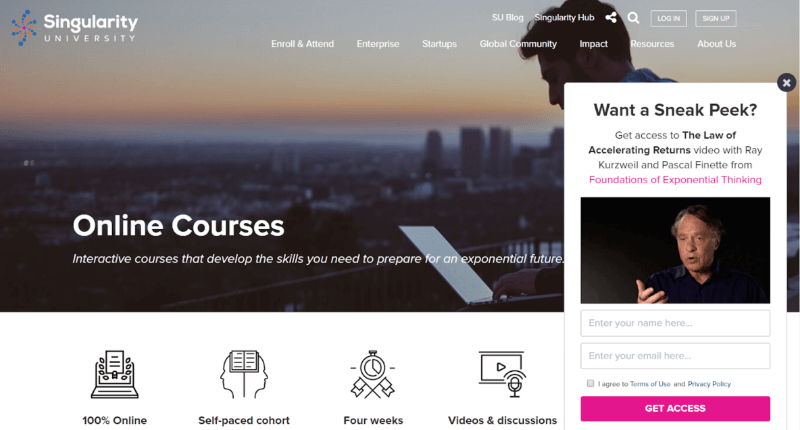 Singularity University helps transform leaders, organizations, and entire industries to help them thrive and ultimately create positive change. Singularity uses OptinMonster in a variety of ways, from their highest-traffic articles to niche landing pages and event registration. OptinMonster helps them maximize their content’s lead capture capabilities. 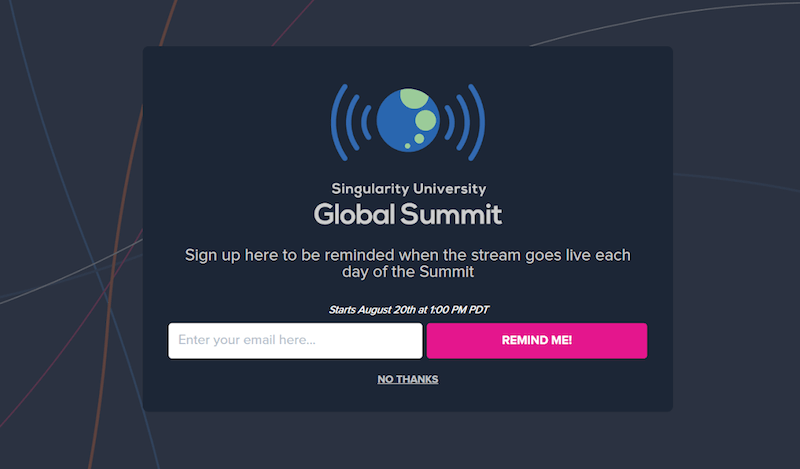 When Singularity was preparing to launch their flagship event, Singularity University Global Summit, they knew they needed a way to engage their community members who would not be able to attend in person. A live stream was the perfect solution! But, how could they remind folks to actually tune in? This fullscreen welcome mat notified users when the livestream was going to happen and was incredibly successful! Singularity captured over 2,000 new email signups in less than nine days with this optin. The fullscreen welcome mat campaign converted 77% of visitors. 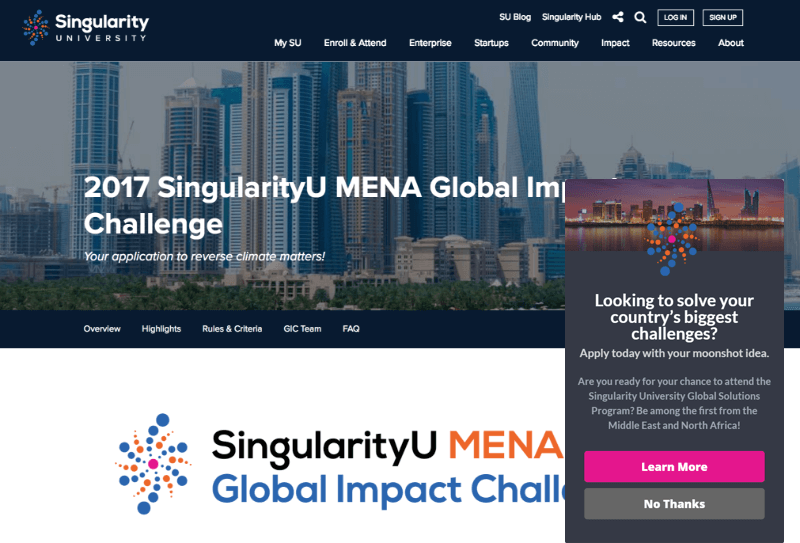 As part of their promotion strategy for the MENA Global Impact Challenge, they ran a highly geo-location targeted optin to 22 countries in the Middle East and North Africa. The goal of this highly targeted campaign was to get users located in a specific area to submit their application. Libratone also used geo-location targeting to make sure their campaigns matched the language of their visitors’ location – and grew their email list 400% as a result! Next, Singularity set up this campaign on their four highest-traffic pages on their news media site, Singularity Hub. The campaign only appeared to visitors about to exit the site. It was triggered using our exit-intent technology. Exit-intent campaigns are triggered when a visitor’s mouse motions towards the browser bar, a sure sign they’re about to leave. Over a period of nine months, this exit-intent optin captured 967 new email addresses on just these four pages! Anyone who sells information products is familiar with this challenge: some users don’t want to immediately pay for a product. They want to see a portion of it first or try it out, to see if it’s a good fit for them. A simple slide-in optin on Singularity’s online course page promises to share a sneak peek of a course in exchange for an email address. These email addresses are then dropped into a nurture campaign, which helps them deliver additional value and track users through the funnel. This slide in campaign converted 10% of visitors. One of Singularity’s earliest campaigns was pretty simple but very powerful. It wasn’t even designed to capture an email. Instead, they encouraged readers who were close to finishing one article to read another when they were done. Using a scroll trigger, the campaign below appeared when the visitor had read 80% of an article. It offered to send the reader to another article they would likely be interested in. This simple prompt led 20% of readers of the article to continue reading the next article in the series. This is a great method for increasing pageviews and average time on site. We have a very diverse lead capture program built out, and follow a strict campaign naming convention so that it’s easier to follow along in Google Analytics’ (GA) Events section. Our naming convention for the title of each optin is “Optin Type – Initiative.” Since these optin titles populate as the Event title in GA, we find it easiest to sort campaigns by optin type and simply compare performance. While the names might seem complicated at first glance, keeping the naming convention consistent makes sorting inside GA much easier. GA Tip: When using the above naming convention and search for “optin” in GA Events, you can easily filter by optin type, campaign, date range, etc. We also use UTMs to track which optins are increasing conversions. It’s easy to measure this using GA, so we know if our Slide-In optin version A or our Mobile optin version B is getting more users to submit an application. Once we know which is more effective, we adjust our practices. Singularity experimented with well-designed, well-placed campaigns and saw great results. 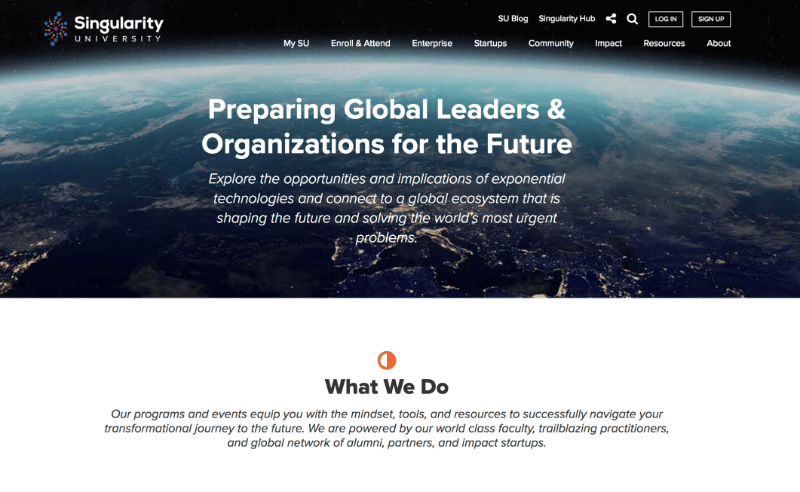 Singularity University registered 25% of location-targeted visitors for an event. Singularity University generated 967 new leads from a single optin. 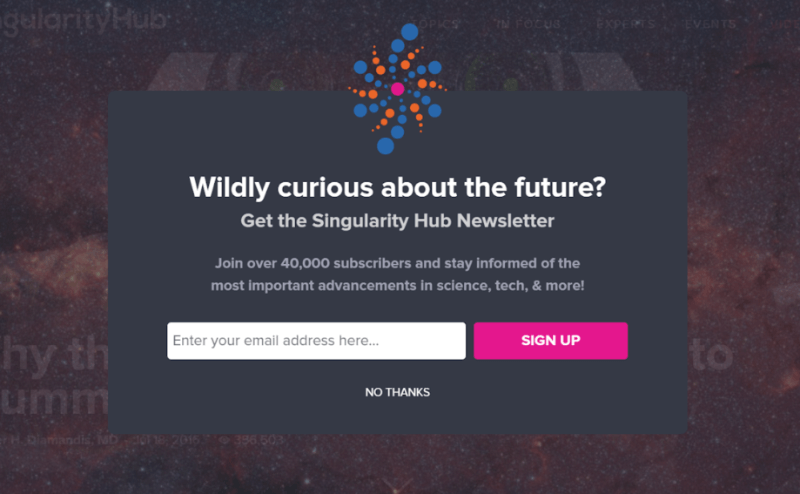 Singularity University kept 20% of visitors onsite longer using a redirect button. Singularity University’s success using OptinMonster is the result of a thoughtful understanding of their readers’ needs. They took the time to consider the behaviors of their visitors, and exactly what they needed that individual visitor to do next, then used a variety of OptinMonster features to encourage them to do that.